Featuring a flattering T-bar guipure lace back detail that skims down the shoulder blades to finish in the classic Anna Campbell silk bow, the Eleanor is romantic and feminine. A strong ivory guipure lace adds a distinct modern element to this timeless and beautiful bridal look. All Eleanor dresses feature vintage inspired guipure lace, a 100% Silk Dupion bust, and 100% Silk Satin skirt lining (with the exception of the Summer Silk Chiffon Skirt and Fitted Silk Crepe De Chine Skirt options which feature a power mesh lining). Customizable just for you, the Eleanor has a selection of skirt options available: A-Line Lace, Brocade Silk Chiffon, Fitted Lace, Fitted Silk Crepe de Chine, Silk Organza, Silk Tulle, Slim Line Silk Chiffon and Summer Silk Chiffon. 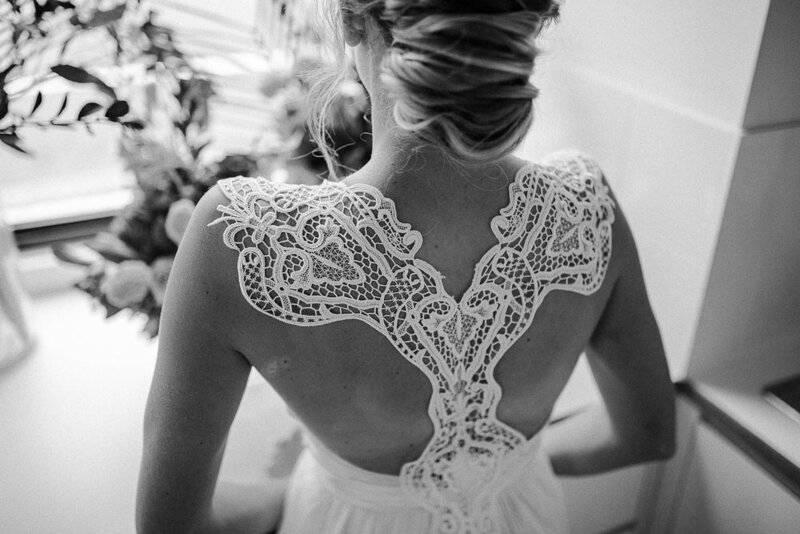 Classic Anna Campbell t-bar back detail in guipure ivory lace. Available in Ivory or Bone (Summer Silk Chiffon and Fitted Crepe de Chine skirt options available in Ivory only).